A loyal follower of my blog, named Keram, graciously volunteered some of his time for a Slania Crazy interview. Enjoy! Slania Crazy: Thank you very much for participting in my "I Interview..." series. Q: What drew you to start collecting Slania? A: He was a Pole like myself and a great artist. He was the author of over 1000 stamps, and he was a champion engraver, which earned him the position of court engraver for the Swedish king. Also important for me was the fact that he was an artist renowned throughout the world, not just Poland. Another thing that impresses me is his engraving technique. He was able to engrave seven lines per millimetre, which created amazing detail and enabled him to include microprints. I commend his hard, painstaking work, using only burins and loupes. On top of all this he was a descent person, with a great personality and sense of humour. He was always willing to share with collectors many anecdotes and interesting stories from his life. And last but not least, he saw the world in lines and points. Q: What is your favourite Slania stamp, and why is it your favourite? A: It is very hard to choose one fvourite stamp. 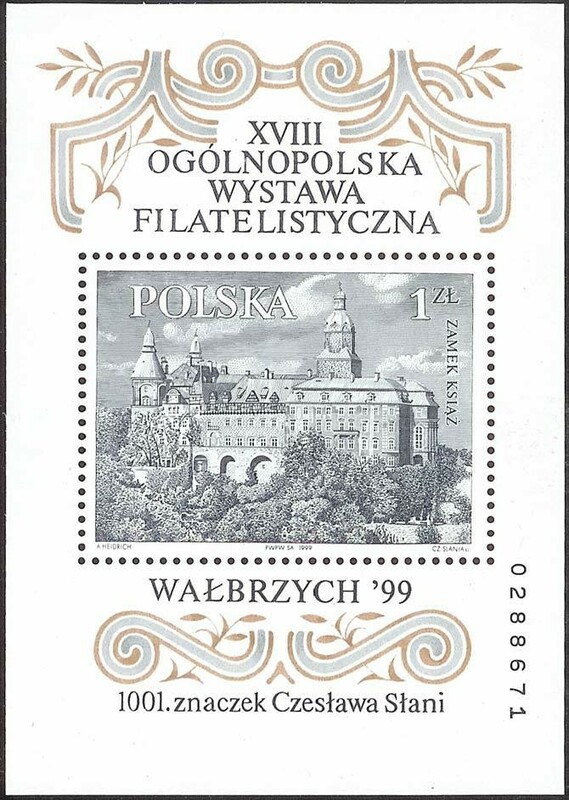 If I had to choose one it'd have to be the Ksiaz Castle Souvenir Sheet issued in Poland in 1999. This stamp is special to me as it looks so realistic. So much detail in such a small space. A: I prefer to do exchanges with other Slania collectors. And I have or have had connections with collectors from the USA, Spain, Great Britain, and Sweden. I have even had contact with a close friend of Slania's. I have purchased items from both foreign and Polish auctions. I also get many items from Polish Web Shops. And Slania Crazy, of course! A: I don't really remember, but it would have to be one from 1950's Poland. I do, however, remember my first foreign Slania stamp. It was a pair of USA Christmas stamps depicting the Madonna and child. This item is signed by Slania in the margin. I got this from a colleague. 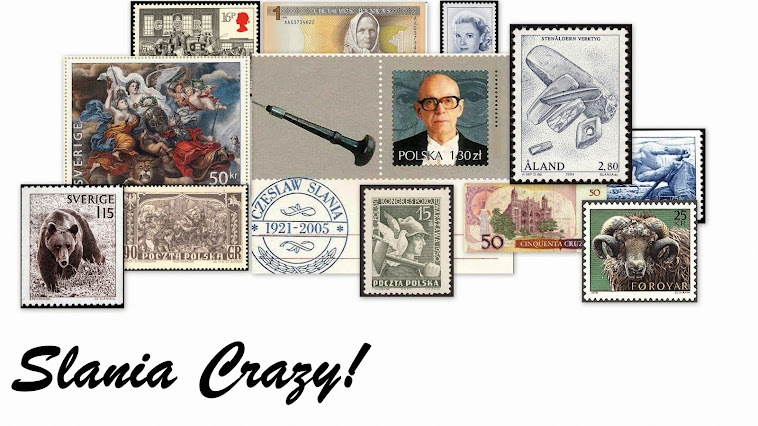 A: Yes, I have some Piotr Naszarkowski stamps. He was another great Polish engraver, and successor to Czeslaw Slania. They even did some stamps together. A: Besides Slania stamps, I collect West Germany, Berlin, Austria, and the early years of Poland. Q: How do you store your Slania stamps? A: I keep my stamps, cards, and FDC's in albums. And I have many, many boxes both small and large containing various items. A: It is important to establish contacts with other Slania collectors. And if you store your collection in boxes, it is essential to label the boxes with a description of the contents. I'd like to thank Keram again for the interview. As always, if anyone else out there wishes to participate, please let me know in the comments. I'm glad you enjoyed the interview, Nivelle. They are a lot of fun to do.